Great tribute video, Squish. My favorite onscreen Lex moment is him singing the song in Eating Pattern. It gets stuck in my head for days whenever I think of it. Great job on the tribute Vid, he did so many characters on the series. Great video Squish. As soon as I finish switching everything over to my new computer I'll be able to get back into my Tube account and add it to my favorites list. Thanks for compiling that video. It was great how Lex kept making appearances throughout the show's history. For those of you who are not on FB, here's a link that Tim Rayne who did radio interview with Lex. My condolences to Lex G. and to all who knew him. His spirit and inspiration will be hard to forget. Thanks Lex G. for giving us Lexx. Squish Thanks for the tribute! I offer my heartfelt condolences to Lex's family and loved-ones. This is also a blow to all of us who did not know him personally, but very much loved his creativity and the show Lexx. Thanks Squish for that video and Angel for posting the screen shots, because you remind us of how truly dynamic a person he was. 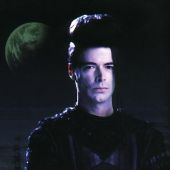 I have always most valued musicians who write their own material because it seems there is the greatest potential for emotive energy in that sort of encompassing endeavor, and Lex's performances in the various shows - modestly done without credit - are similarly some of the most compelling performances of all of Lexx: and that is saying much indeed. Edit: Kaden - yes! That is my number one favorite scene of the episode and perhaps the whole series. I wasn't here for a while ... and now this bad news... I am really sorry but I can't find the right words to express myself the right way. I just can say that I only can thank him for his great work and that I will watch LEXX now with a different point of view. I loved Lex G's guest performances in Lexx and I will also remember him fondly for his participation in one of the coolest Xmas films ever. Whatever the guy did, it never failed to cheer me up. Until now. My condolences to Lex's family and friends. He will be greatly missed - until we maybe all meet again in the next cycle of time. Maya do you happen to know the link for the FB Page? There are two others, just do a lex Giggeroff search and you can find them. I was shocked and dismayed to hear the news, too. I had only one exchange with Mr. Gigeroff, when I interviewed him for my retrospective on Lexx. He was friendly and helpful - funny, too. His untimely passing is a real loss, and I too offer my condolences to his family, friends and fans, here and everywhere else. A new announcement by Andre on Facebook today..
ALEX GIGEROFF AND ANDRE HAINES INVITE EVERYONE TO A GATHERING IN MEMORY OF SON AND BROTHER LEX GIGEROFF. BORN JUNE 29, 1963 DECEASED DEC 24 2011. KNIGHTS OF COLUMBUS HALL, COLLINS STREET, YARMOUTH NS. sUNDAY JANUARY 22 1 - 5 PM.